Widespread electric vehicle (EV) adoption faces several challenges, including lack of consumer awareness, limited EV inventory, insufficient sales training, and the high price of new electric cars. EV group buy programs address these obstacles by bringing together local governments, nonprofits, electric utilities, auto dealerships, and auto manufacturers to boost EV sales through a combination of community engagement and EV purchasing incentives. What are EV group buy programs? EV group buy programs are organized by lead agencies such as local governments, who negotiate limited-time discounts on EVs with car dealerships or auto manufacturers. Lead agencies are then responsible for coordinating a community-driven marketing and outreach campaign to educate the public about the environmental and economic benefits of EVs, and to promote the dealership discount. One great advantage of a group buy program is that it very inexpensive for a local agency to run, but it still produces large benefits. The lead agency’s role is harnessing the collective buying power of the community to negotiate a discount from private sector providers (car dealers and auto manufacturers), and then using access to the community to spread the word. Existing state and federal tax credits improve the deals. For a very small outlay of staff time and money, lead agencies can create a big improvement in the community. Such tools are particularly relevant for communities that have set climate goals to reduce greenhouse gas emissions from the transportation sector. In Colorado, Governor John Hickenlooper introduced Colorado Electric Vehicle Plan, which sets an ambitious target of 940,000 EVs in the state by 2030. The state and its municipalities will need to implement specific actions to achieve this goal and show car makers that Colorado can become a substantial market for EVs. EV group buy programs provide the short-term EV sales growth and long-term dealership training and model availability required to establish a sustainable EV market. In September of 2015, Boulder County launched the nation’s first EV group buy program, working with Boulder Nissan to negotiate a $8,349 group discount off the 2015 Nissan LEAF. 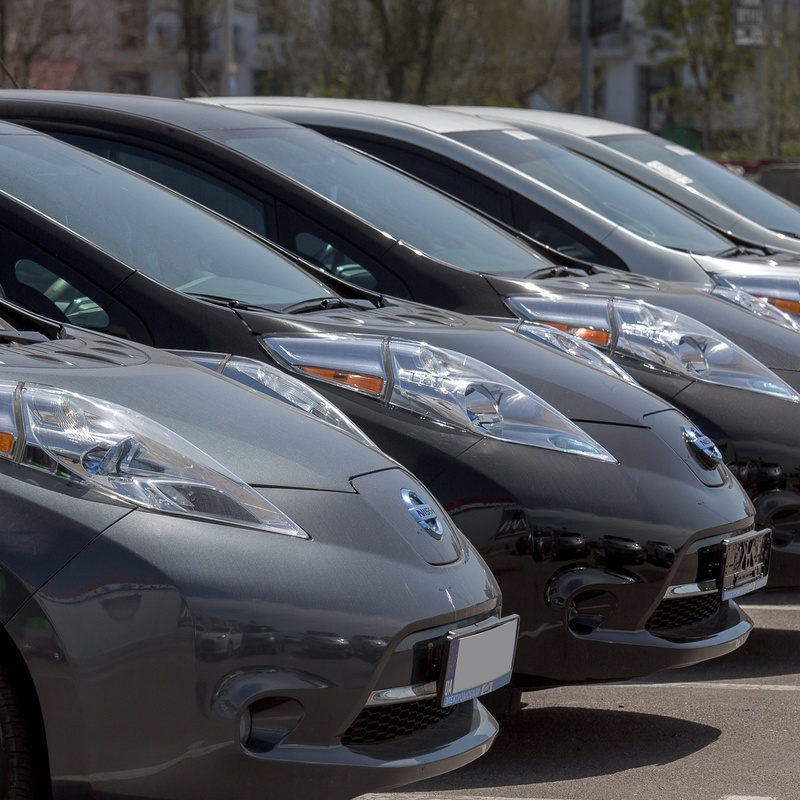 When combined with state and federal tax credits, the net price for the LEAF was $12,130, a 62 percent discount off the $31,500 retail price of the vehicle. In just four months, Boulder Nissan notched 248 LEAF sales, quadruple its previous monthly average. Such large discounts for a brand-new vehicle were unprecedented and, unsurprisingly, were the main reason that many consumers choose to buy an EV. After the initial program’ success, SWEEP partnered with Boulder County, the Colorado Energy Office, and BCS, a consulting firm, to develop both a case study and a how-to-handbook. The updated report summarizes lessons learned from three years of experience with these programs, and provides recommendations and resources to assist local and state governments, utilities, universities, and nonprofit community organizations interested in organizing or participating in group buy programs. Since the publication of our first handbook in 2016, the group buy concept has spread to other areas of Colorado and beyond, to Utah, Wisconsin, Oregon, and Massachusetts. In the last three years, 48 programs have launched in 20 states. Almost all of these programs have been recurring, with multiple limited-time offerings renewed seasonally or annually. At least 80 different local governments, nonprofits, utilities, universities, auto manufacturers, and employer groups have participated in EV discount programs. In one example, the Hogle Zoo in Salt Lake City partnered with local environmental groups and car dealers to promote an EV group buy program to the zoo’s visitors with the clever tagline, ZOOm Go Electric! How has the group buy model evolved over the last 3 years? 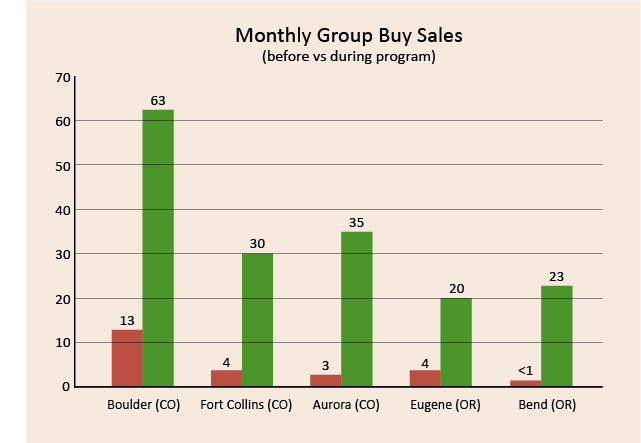 The group buy model has evolved from the traditional request-for-proposal (RFP) model to fit the context, with many smaller communities, like Eugene, OR and Bend, OR, adopting a more direct approach to dealership negotiation, and larger cities, such as Salt Lake City, UT, and Aurora, CO, exploring more expansive and creative outreach strategies. More recently, these programs have attracted the attention of national auto manufacturers, or original equipment manufacturers (OEMs) like Nissan and BMW, and electric utilities such as Xcel Energy (CO) and Rocky Mountain Power (UT). In over a dozen states, these large corporate entities are collaborating on regional EV discount programs, promoting sizable vehicle discounts to large audiences of electric utility customers. In Massachusetts and Rhode Island, Mass Energy Consumers Alliance developed a multi-state “rolling” group buy program, where dealership discounts are re-negotiated each month and listed by the organization on their public website. While the average group buy runs for two to three months, the “rolling” Drive Green program has been operating for almost 21 months. This model has demonstrated an ability to expand the program beyond the usual group buy supporters (Nissan and BMW) and now includes deals from 11 different auto manufacturers across 34 participating dealerships. Greater dealership participation has proven to increase consumer choice and drive competitive pricing in regional auto markets. Do EV group buy programs actually generate new sales? Group buy programs have consistently delivered results in communities all over the country, boosting dealership sales by up to 10 times the monthly average. In developed EV markets with pre-existing demand, like Boulder, CO, the programs have built upon strengths and accelerated market growth. In underdeveloped markets, like Bend, OR, they have played a pivotal role in getting EVs on the lot at local dealerships, and in training sales staff on the performance, charging requirements, and tax credits for EVs. The OEM-Utility model, in which an auto manufacturer partners with an electric utility to promote an EV discount, has proven to sell the most EVs because it offers the biggest discounts to the largest audience through utility marketing and outreach. In the summer of 2017, Xcel Energy partnered with Nissan and offered a $10,000 discount off the Nissan LEAF. The program sold 849 LEAFs across 15 dealerships in Colorado. The program’s sales accounted for 63 percent of all battery-electric vehicle sales in Colorado over that six month period. One concern might be that these programs simply draw customers who would have purchased an EV whether or not the program existed. According to surveys from multiple programs, EV group buy programs encourage people who were not planning to purchase an EV to reconsider. Results from the Boulder County group buy survey found that 72 percent of the respondents were not originally planning to buy an EV before learning about the cars and discounts. The survey also shows that more than 90 percent of people who entered the process, but did not actually buy a vehicle, are now interested in purchasing an EV in the future. These findings suggest that group buy programs succeed in generating new EV sales, rather than just displacing them from before or after the program. The biggest challenges for dealerships are securing sufficient EV inventory to satisfy program demand, and preparing the sales staff to answer questions about the technology. Under normal circumstances, studies suggest that auto dealers are unlikely to direct customers toward EVs because of historically low sales and inadequate training for sales staff. It’s important for auto industry partners to invest in EV inventory and sales training to reverse this trend. The most successful programs have an EV “Evangelist,” a sales person or program partner who is passionate about EVs and who is willing to go above and beyond for the program. Some utilities go one step further by offering dealership rewards of up to $500 for every EV sold. These “midstream incentive” programs motivate car salespeople to be aware of, and forthcoming about, the benefits of EVs. When possible, dealership rewards should be introduced alongside EV discount programs to build interest and excitement around EVs at the dealership. To better prepare for inventory pressure, dealerships can look at sales data from previous programs in similar markets to inform their own vehicle supply strategies. For the 27 EV discount programs that reported sales data, the average number of total EV sales was 124 and the average per month was 37. To avoid significant program delays, participating dealerships can secure inventory ahead of time, establish correspondence with other regional dealerships, and develop vehicle-trading terms to be used in case of inventory depletion. One of the keys to success is a vigorous community-based outreach effort. After all, an individual car dealer could simply offer a deep discount on its own, but what makes these programs different is the ability of trusted messengers—such as local government, environmental groups, utilities, community-based nonprofits, or employers—to reach their constituents. Participant surveys found that on average, consumers trust environmental organizations and local governments significantly more than car dealerships. 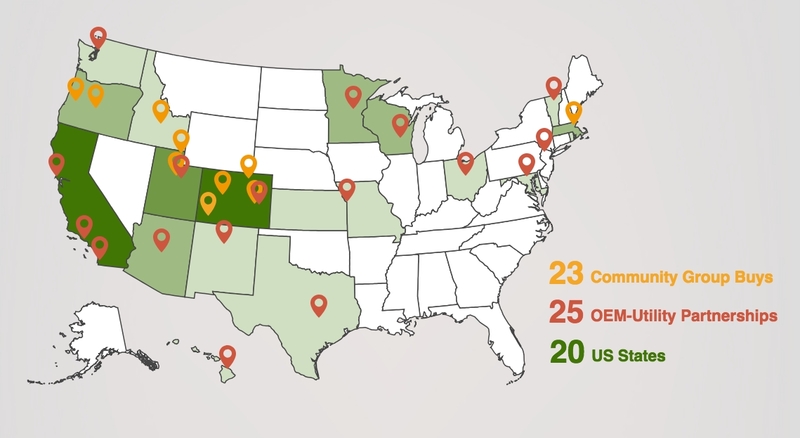 OEM-Utility partnerships present a unique opportunity for national OEMs and regional electricity providers to collaborate with the communities they serve on program marketing and outreach. Local agencies such as governments, nonprofits, and universities bring strategic connections and community trust, while electric utilities and OEMs offer media and communication expertise. Electric utilities like San Diego Gas & Electric and Xcel Energy have both expressed an interest in working with local communities to promote their EV discount programs, but they don’t have the relationships or networks in place to facilitate such partnerships. As utilities branch out and engage with local stakeholders, opportunities to build networks and collaborate with dealer associations and environmental groups should be explored further. There is a fast-approaching window of opportunity for EVs, inside which government purchase incentives will overlap with decreasing battery costs and growing model diversity to produce greater choice at a lower cost. By offering further discounts on EVs, group buy programs can capitalize on this convergence and be the matchstick that ignites a mass adoption of EVs. Western Colorado EV Sales Event: Offering discounts on Audi, Chevy, Nissan, Honda, Toyota, and Chrysler EVs. Program is set to launch August 1, 2018. Refuel Colorado, Durango, 4CORE: Offering discounts on Nissan and Chevy EVs. Drive Green with Mass Energy (MA, RI): Rolling group buy program offer discounts on 14 vehicle models from 11 different OEMs at 34 participating dealerships. Nissan Fleetail: Offering a $3,000 discount off the 2018 Nissan LEAF through partnerships with electric utilities such as: Xcel Energy (CO, MN, WI), Colorado Springs (CO), Salt River Project (AZ), Arizona Public Services (AZ), Public Service Company of New Mexico (NM), Rocky Mountain Power (UT), and many others. UC-San Diego Electric Vehicle Leasing/Sales Program: Offering deals for university students, faculty, staff, and retirees for BMW, Ford, Mercedes-Benz, and Nissan EVs. Southern California Edison (SCE): Offering a $10,000 discount off the 2018 BMW i3. San Diego Gas & Electric (SDG&E): Offering a $10,000 discount off the 2018 BMW i3, and a $3,000 discount off the 2018 Nissan LEAF. Boulder County Electric Bike Discount Program: Offering at least 10 percent off electric bikes. University of Utah / Utah Clean Energy Electric Bike Discount Program: Offering a $250-$2,500 discount off the $1,500 to $6,000 retail price of electric bikes.